This Case Study takes us back in history, specifically to 520 BC, to the time of the Etruscan civilization, thanks to an installation devoted to the Sarcophagus of the Spouses at the Museum of the History of Bologna. 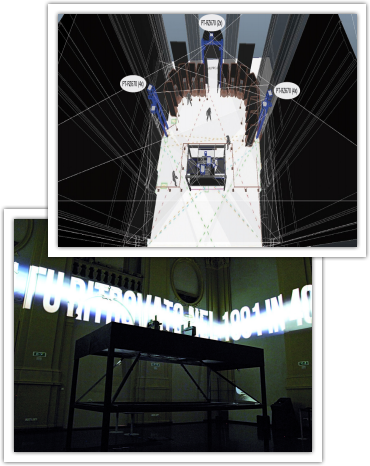 Combining holographic techniques, 3D video projection mapping and surround sound, this production has been developed by Cineca, under the technical supervision of Franz Fischnaller and the direction of Giosuè Boetto Cohen and with production by Acuson, to create an immersive audiovisual storytelling environment. Successfully digitising a funerary monument more than 2,500 years old is not a trivial undertaking. But a group of researchers has successfully recorded every detail of this masterpiece and supplied Cineca with a treasure trove of digital data to convert into a full scale virtual model and engaging installation, which tells the story of the monument. "Digitally acquiring the sarcophagus," as Antonella Guidazzoli explains, "was a complex operation which was only possible because the urn could be removed from its protective showcase and opened up. This led to the discovery and documentation of new information which will be of use for future restoration. Data capture was carried out using photogrammetry and laser scanning by a team of researchers from CNR, Italy's National Research Council, the University of Bologna and Fondazione Bruno Kessler. Two people were primarily responsible for following on from the data collection and processing tasks. "These were the director Giosuè Boetto Cohen, who has long been at the forefront of innovation in developing cultural heritage projects and has worked together with Cineca for some time, and Franz Fischnaller, an internationally renowned pioneer in producing virtual installations at the frontiers of art and technology. Working together, they developed the installation within an exhibition itinerary requiring flexibility in both artistic and technological terms," continues Antonella. "In addition, the archaeological content, underpinned by music and creative suggestions, was combined with cutting-edge, but transparent, technology. 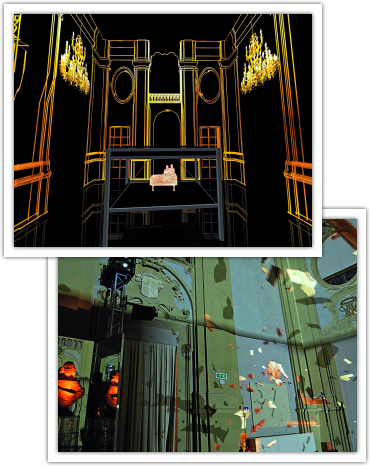 All of this was led by skillful technology management capable of breathing life into the installation's plot and of slotting into the ICT production environment based on Blender and on a collaborative, interdisciplinary approach to interpretation applied at Cineca's VisiT (Visual Information Technology) Lab. The Sarcophagus of the Spouses project," emphasises Antonella, "is intended to reach a broad international audience of all ages. In the future, this installation will make it possible to assess visitors' emotional engagement from recordings made using existing standardised protocols and involving the latest findings of neuroscience. Moreover, the richness of the digital dataset will allow further cross-media applications and new installations involving visitor interaction to be developed". At the heart of the installation is Panasonic technology. Make the installation transportable, reproducible and adaptable to other exhibition spaces. This major historical monument was faithfully reconstructed using 10 Panasonic PT-RZ670 full laser projectors with an HD wide angle 0.8-1:1 zoom lens. Using a combination of stacked and edge blending projection, life has been breathed into a stereoscopic reconstruction of the funerary urn. The light output of 6,500 ANSI lumen and low Total Cost of Ownership (TCO) achieved thanks to the absence of maintenance are of fundamental importance for use in a museum environment. The projector's light source has a certified life of 20,000 hours. It was decided to use an integrated solution combining architectural 3D video mapping and holography. The resulting 3D effect is enthralling and is based on over 400 fragments which have been found and which, once reconstructed, bring the Sarcophagus of the Spouses to life. Users are thrilled by the experience of suddenly finding themselves, on entering the room, right in the middle of an explosion of hundreds of tiny fragments. "Since autostereoscopic technology is not yet mature, the installation makes use of a three-sided holographic pyramid and a 3D video projection mapping system covering a total area of 360m2. This effect is created by an array of Panasonic projectors which together generate an image of 2000 x 8000 (HxW) pixels resolution, bringing a huge mapped surface reaching up to 12 meters in height to life," explains Gabriele Magagna from Acuson. "The entire projection relies on a single large calculation which is subdivided for each individual unit and managed by two synchronised servers each with six output channels, giving a total of 12 channels. "The wall surfaces were subdivided in two horizontal parts, receiving output from a total of 10 laser projectors: the lower part, up to a height of 4 meters, covered by a total of four projectors, two at the sides and two in the middle which operate in edge blending mode; and the upper part with a base length of 14 meters and a height of 8 meters, managed by six laser video projectors, two for each wall, installed in stacking mode for larger, brighter images. The purpose of this type of projection is to map the walls and, at various points in time, to project the content of a short film which lasts a little over 10 minutes. Following Panasonic's recommendation, we used Geometry Manager Pro software for each individual projector to facilitate edge blending and enable stacking, ensuring perfect accuracy. "An aluminum framework, attached to the walls for greater stability, was installed for mounting the video projectors, while mounting brackets were fitted to support each projector, in particular those used in stacking mode," added Gabriele Magagna. "The choice of laser video projectors was not arbitrary. The benefits are well known: neither lamp changes nor air filter replacements are required. For a place like a museum which receives a constant, daily influx of hundreds of visitors, cutting maintenance to a minimum is a considerable advantage since service is not interrupted at any time. Moreover, the light output from these projectors does not decline and colour does not drift over time. The final result is bright, sharp images with high resolution reproduction".